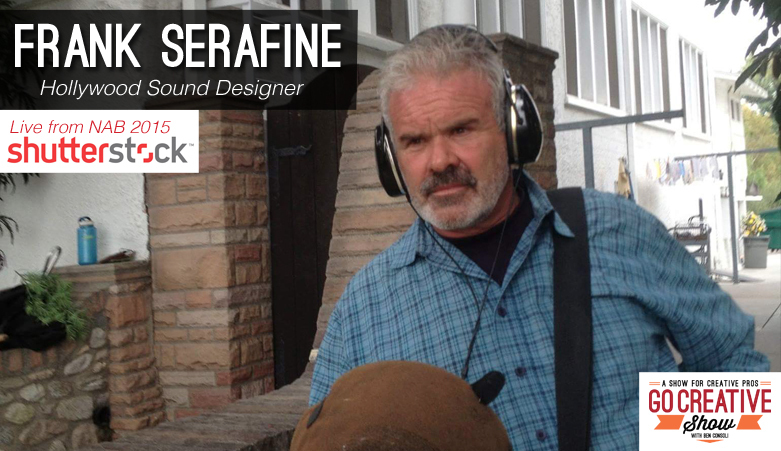 Today I’m joined by Matt Russell as we conclude our coverage of NAB 2015 with an interview with legendary Hollywood sound designer, Frank Serafine. We discuss his incredible career designing sound for films like StarTrek, Tron and The Hunt for Red October plus his upcoming nationwide Sound Advice tour. Frank Serafine is the Academy Award Winning Hollywood sound designer behind films like Star Trek, Tron, The Hunt for Red October and countless more. We discuss Franks early days using a mellotron to create sound experiences for planetariums and how that led him to Disney and eventually Star Trek. Frank also designed sound for interactive experiences at Busch Gardens and video games including Grand Theft Auto. Now, Frank is celebrating his enormous success by sharing his knowledge as he embarks on the nation-wide Sound Advice Tour and he’s on today’s show to talk all about it. How “space sounds” on a mellotron started a career. The old school days of film sound design. Creating sound for science fiction vs real life. Just to follow up on the uptdae of this issue on your web site and would really want to let you know how much I prized the time you took to produce this helpful post. In the post, you spoke on how to actually handle this problem with all convenience. It would be my pleasure to get some more tips from your blog and come as much as offer other people what I have benefited from you. I appreciate your usual great effort.